The Ford Mustang is an extremely popular sports car among drivers. That is why we here at Awesome Ford are so excited about the latest model. One of the first things we want to draw your attention to is the incredible selection of wheel types that you can outfit your Mustang with to truly make it your own. This will certainly turn some heads on the roads as you pass by. You'll also be quickly seen with the brand-new LED head lights that are available this year. LED head lights make for brighter light and are more efficient, which means they will need to be replaced far less often. 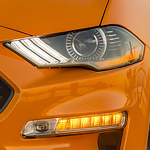 If you would like to test drive a new Ford Mustang to see all of the design features up close and personal, then feel free to either give us a call to schedule an appointment or stop on by Awesome Ford in Chehalis today!